Chart No. 6 - Electro-Magnetic [Electromagnetic] Currents and Their Proper Anatomical Relations Anterior and Posterior View of Overall Sweep Plus Polarity Centers. Fig.1 shows the palms of the hands relating to the anterior sensory part of the body. It gives the correct position of thumbs in relation to central area of entire body. 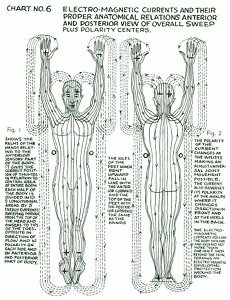 Each half of the body is divided into 5 [five] longitudinal areas by 5 [five] energy currents sweeping through from the top of the head and fingers to tips of the toes. Opposite in direction of flow and in polarity on each side and on anterior and posterior part of body. The soles of the feet when bent upward fall in line with the anterior currents and the top of the feet with the posterior currents the same as the hands. Fig. 2 The polarity of the current changes at the wrists making an almost universal joint movement possible. The current also reverses its polarity at the ankles where it changes direction in front and at the heels in the back. 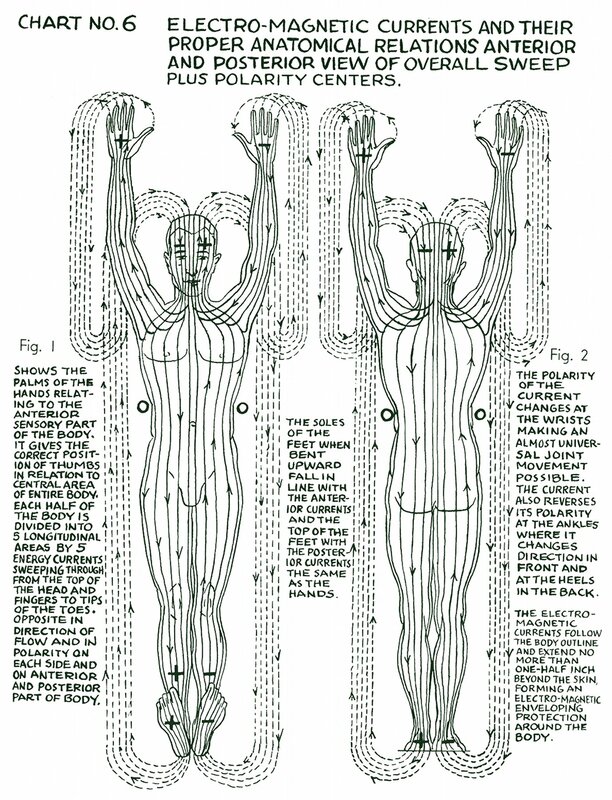 The electro-magnetic [electromagnetic] currents follow the body outline and extend no more than one-half inch beyond the skin, forming an electro-magnetic [electromagnetic] enveloping protection around the body.